This week was spent writing a bit and working on a super secret project, which, amazingly enough, is coming to fruition. If it all continues to rum smoothly then expect to see a huge announcement. Well, huge for us anyway and it could very well benefit local authors, hell, ANY author who wants to see an outlet for their own publications. Watch this space for more details as they arise. Reading wise I spent a bit of time finishing off half and 3/4 read books, just to get them out of the way. This involved a speed read of what came before to refresh my memory and then a normal (normal for me) read to the finish line. What did I finish this week? Believe it or not Noel Coward visited Australia and New Zealand once and here's the proof of that visit. This double sided card was issued as a souvenir of Coward's appearance in Melbourne on the 28th November, 1940. I have no idea how many of these exist these days, nor it's worth but I expect that the numbers aren't very high in both departments. As a souvenir it's a nice little item, postcard size and I'd expect somewhat desirable to Coward collectors - and yes, I expect that those people are out there. I've always said that people collect anything, including barbed wire. Once Coward left Australia he wrote a book, collecting his broadcasts. Titled 'Australia Visited' and published by Heinemann (London) 1940. Before anyone asks, nope I don't have it, yet, but considering that Coward's speeches still amuse me, I'll be looking for a copy very shortly. Amazing isn't it? When the Beatles played Australia for the only time in 1964 Ringo was out with an illness, so in stepped drummer Jimmy Nicol. 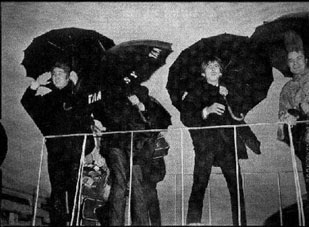 Jimmy was with the band when they touched down in Sydney to a torrential downpour, not that it stopped an estimated 1,000 fans plus a handful of journos from coming out to see them as they did a lap of the airport in the teeming rain. From there the band flew to Adelaide where an estimated 350,000 people wagged school, skipped work and generally took the day off just to see them - that was around 1/3 of the total population of South Australia at the time. It remains probably THE largest, crowd to turn out to see the band. George Harrison and Paul McCartney always commented on the size of the crowd, even thirty years after the event. Jimmy was there...amongst the adulation and was turned out to greet the masses of Lunchtime O'Boozes all of whom wanted a quick soundbite.